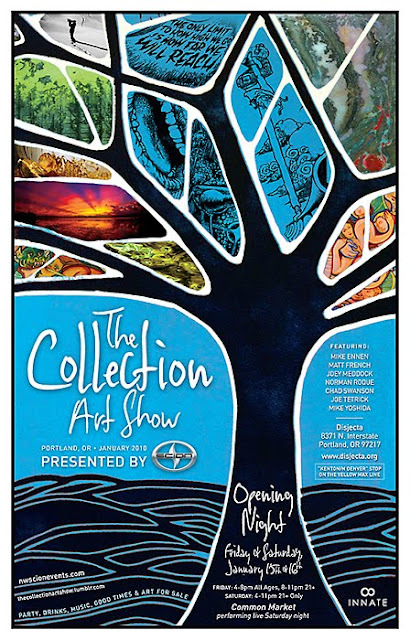 Hot on the heels of the I AM SNOWBOARDING art show the weekend prior, The Collection art show comes to Portland, Friday, January 15. This show is not entirely snowboard-centric, so don't be surprised when you show up and see shots of dudes being towed behind boats. Action sports, folks, we're all brothers and sisters. You might have heard of Mike Yoshida or Matt French. Their work will be among the fine examples on display. Saturday night Common Market will provide the beats and rhymes. Judging by the corporate sponsorship, you might snag a free beer. In any case, you'll get to check out some high-quality art or have said art look over your shoulder while you party. For more info check here or here. Also, thanks to frequency for getting the word out elsewhere.